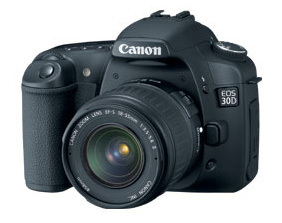 Canon has announced an update to its popular midlevel DSLR line -- the EOS 30D. Even though this model sports a larger 2.5-inch, 230,000 pixel LCD monitor and a shutter rated up to 100,000 cycles, the price remains $1,399 USD for this 8.2 megapixel body. The other notable upgrade over the 20D is a new spot meter covering 3.5 percent of the viewfinder. This will be welcomed by serious shooters who were often frustrated by Canon's "partial metering" mode which had a much broader 9 percent coverage. Two new lenses were announced too: the EF-S 17-55mm f-2.8 IS USM with internal stabilization ($1,149) and the EF 85mm f-1.2L II USM ($2,099).